I honestly can’t decide between a lesson based on a more two-dimensional/personal MyMaps project or a group storytelling project. At first I leaned towards the MyMaps project because it was more concrete and could be a task maintained throughout a history or Alaska studies course, but the storytelling lesson keeps coming back because it seems a little more creative and might be better at engaging students. Essential Question: How have the Inupiat taught their children to be resilient and thrive in Northern Alaska region? Source Material: Additional time required to gather these specifically, but videos and stories, documents of historical events, maps, and place-name maps, Inupiat Values. Students will create and maintain a travel journal, written in the first person based on different perspectives (elder, parent, youth, outsider) chosen or assigned by groups. Each student will maintain a personal MyMaps that will be the visual representation of their travel journal, students maintain this throughout the course (AK History specifically for this lesson, but could be tweeked for use with US History or World History because of impact of exploration and commerce). At the conclusion of each region or the course, students will give a short presentation indicating the locations they liked ‘visiting’ the best and why or they can read their favorite journal entry and explain why they picked it or it’s relevance to their life today. Entry points and locations will be pre-determined and be related to either subsistence or community/cultural event or a historical event that happens (first explorers/contact, outside whaling causing difficulty, creation and/or failure of whaling station, whale harvest celebration, trade fair, or migration for subsistence/trade. Current events: whaling commission, oil. Students will analyze these points/locations/events from the perspective of a youth, an adult, an elder, or an outsider. The focus being on how resiliency/subsistence/values are taught to youth in order for the Inupiat to thrive in the arctic region. These perspectives would be assigned individually or by groups and would change almost every entry point to get students to understand different perspectives. This will be based on the same information provided, focusing on the Inupiat life between exploration/contact and the first exploitation of resources (whales) and the most recent demand for an arctic resource – oil. Students would be put in small groups to create their own story that is meant to be told to youth to teach them how to be resilient and to thrive on this land. “This is how we got where we are today…” will be the perspective/theme they will be telling the story from. Students should incorporate Inupiat history, values, subsistence, connections to land/animals, historical events, etc. 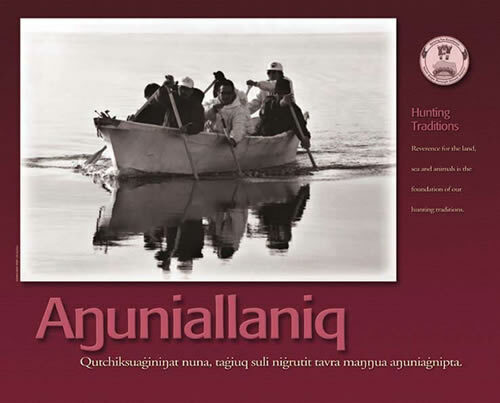 The emphasis will be placed on creating an engaging oral history – based on events and cultural values – this will reiterate the value and validity of storytelling among the Inupiat as well as the value and respect for a good storyteller. How the story is presented is flexible, whether it is presented in front of the class directly or if they do a voice-over of images. They could also create a haiku deck to show the events or values they are emphasizing in their story. Or the lesson could take on a different look and have groups create a story based on different historical events or cultural events. If I break groups up into historical/cultural events I could create active listening goals for students to draw small representations of each groups stories to help them remember the event and values. Eventually having other groups repeat other stories. Misha – Both are great ideas! Option 1: MyMaps is great at presenting information that has locational component. You can number locations in sequence so that their is a route. (it does allow you to make walking and driving tours, but that requires that their be roads that Google maps is aware of). Since it allows for entering text, you could have them keep their “journal” in MyMaps, or they could write that separately and use the MyMaps for location. MyMaps allows for “layers” so that multiple students could collaborate on one map and have their perspective as new layer that could be clicked on or off to view. Option 2: Great idea for creating oral histories. Haiku Deck might be one way to capture that, but the amount of text on each slide is somewhat limited. You might capture oral history on tape and then use Haiku Deck to illustrate it. I think a better way to capture the oral history would be for students to create a story, illustrate it with visual slides – could be PowerPoint, Apple Keynote or Google slides. Then have them record an audio narration over the slide show. I really like the direction you’re heading. Both projects drive students to learn the material from multiple perspectives, and they are creative and engaging. I gravitate toward both of them for different reasons. I wonder if both options could be given to students, similar to the two options we were given. It could give students the chance to take their knowledge and apply it in a way that resonates with them. Great use of the material! Mischa – I like both units too! But for the sake of just choosing the one I liked slightly more… I would go with the storytelling unit. I think your idea is really powerful that the stories students created would be “meant to be told to youth to teach them how to be resilient and to thrive on this land.” We hear stories like this from our parents, from local Elders, but this generation is full of amazing ideas and access to technology and completely new concepts. I am so interested to see what students might come up with! I like the idea of them practicing re-telling the stories to one another too because that is a different skill set than writing the story. I think Haiku Deck would be a great tool to use to get ideas flowing before the final story was written, or Haiku Deck could be used as a complete project if it was a younger age group.